Since the announcement on Friday in Brussels and Rabat that Morocco and the European Union have agreed on the content of the bilateral fisheries agreement including Western Sahara, the Polisario has been seething and for good reason. The text definitely does not recognize any representativeness to the Algeria-backed separatist movement. After four rounds of negotiations for the renewal of the fisheries agreement that expired on July 14, the announcement of a Morocco-EU agreement confirms Morocco as the only interlocutor entitled to negotiate international agreements including the Sahara. Suffice to say that the intense lobbying conducted by Algeria behind the scenes of the European institutions in favor of the Polisario front has failed miserably. The adaptation of the fisheries agreement to comply with the judgment of the EU Court of Justice will be in the form of an exchange of letters between the two parties. Thus, the negotiated text mentions explicitly that the tariff preferences recognized to Morocco also apply, under the same conditions, to fish products caught in the waters of the Moroccan Sahara. 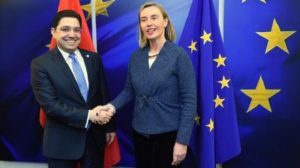 The announcement of the agreement came only days after the EU Foreign Ministers Council decided, on July 16, to adjust the Association Agreement and the Agricultural Agreement between Morocco and the EU to include explicitly the Sahara. The Council’s decision has thus paved the way for the conclusion of the fisheries agreement, which constitutes an obviously scathing setback to the Polisario and its mentor, Algeria. Now, the fisheries agreement needs to be endorsed by the European and Moroccan parliaments so that the vessels from 11 European countries resume their activities in Moroccan waters.